And now without further ado, meet our new crew! Caroline Acheatel, MEM/MArch*, is traveling to Mexico for a project titled La Vecindad: Communal Housing as a Green Infrastructure Opportunity in Mexico City’s Water Crisis. Beryl Ajwang’, MEM, is traveling to Kenya for a project titled Energy Access and Finacial Inclusion: Are PAYG solar products promoting digital finance access among poor rural households in Kenya. Coral Bielecki, MESc, is traveling to Hawaii for a project titled Power and Resistance: A Case Study of Kahoolawe Island in Hawaii. Mary Burak, PhD, is traveling to Tanzania for a project titled Human-Wildlife Coexistence Landscapes: Assessing Spatial Patterns of Maasai Tribal Land Use and Lion Connectivity in Tanzania. Julia Calderon Cendejas, MF, is traveling to Mexico for a project titled Community Based Forestry as a Tool for Indigenous Land Rights Defense: case study with Raramuri communities in northern Mexico. Kelechi Eleanya, MEM, is traveling to Nigeria for a project titled Socio-economic contributions of the wood-furniture industry to urban and rural livelihoods in Northern Nigeria. Liz Felker, MESc, is traveling to Ethiopia for a project titled 15 Million Hectares of Degraded Land: Policy Narratives and Lived Meanings of Land Use in Ethiopia. Michaela Foster, PhD, is traveling to Ghana for a project titled Will more international aid solve the deforestation crisis? Transforming aid into outcomes. Jacqueline Hall, MEM/MArch, is traveling to Mexico for a project titled La Vecindad: Communal Housing as a Green Infrastructure Opportunity in Mexico City’s Water Crisis. Caroline Hobbs, MEM, is traveling to Hawaii for a project titled Color Morphology in Montipora capitata living in different reef environments. Kangning Huang, PhD, is traveling to China for a project titled The Compound Heat Extreme in South China from the Urban Heat Island Effect and Climate Change. Chelsea Judy, PhD, is traveling to Ethiopia for a project titled Linking Patterns of Land Ownership to Environmental Degradation and Economic Inequality in Ethiopia. Brian Lee, MEM, is traveling to Rwanda for a project titled Vertebrate species biodiversity in abandoned mining sites in Nyungwe National Park, Rwanda. Chris Martin, MEM/MBA, is traveling to Brazil for a project titled Conservation Finance for Sustainable NTFP Extraction in the Brazilian Amazon. Ethan Miller, MF, is traveling to Kenya for a project titled A Spatial Approach to Understanding Resource Use in the Mau Forest Complex. Julia Monk, PhD, is traveling to Argentina for a project titled Puma predation, scavenging, and the fate of nutrients in the High Andes. Juan Penagos Zuluaga, PhD, is traveling to Panama for a project titled Ecology and evolution of the gynodioecious breeding system in early-divergent flowering plants. 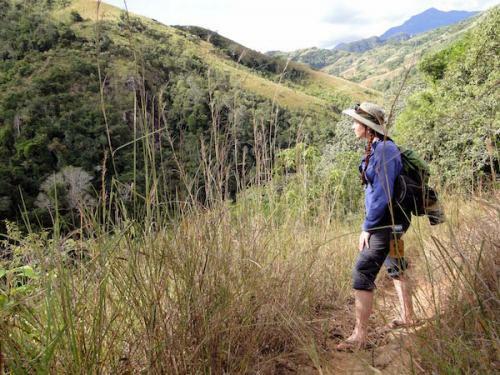 Emma Rapperport, MESc, is traveling to Ecuador for a project titled Trends in Intergenerational Agricultural Knowledge Transfer in the Ecuadorian Andes. Ben Rifkin, MFS, is traveling to Madagascar for a project titled Analysis of Forest Growth Structure and Implications for Regeneration of Tamarindus indica-Dominated Tropical Deciduous Dry Forest in Bezà Mahafaly Special Reserve in Southwestern, Madagascar. Elham Shabahat, MEM, is traveling to Rwanda for a project titled The Untold Stories of Gishwati-Mukura: A study of community-based conservation in Rwanda. Megan Sullivan, PhD, is traveling to Gabon for a project titled Effects of selective logging on Afro-tropical forests and implications for sustainability. Eli Terris, MEM, is traveling to Mali for a project titled The Social, Economic and Consumptive Roles of a Disappearing Tree Among Southern Malians. Harikrishnan Venugopalan Nair Radhamoni, PhD, is traveling to India for a project titled Impacts of Human Disturbances on the Phylogenetic and Functional Diversity of Tropical herbaceous plants in Western Ghats, India: A Pilot Study. Weiyang Zhao, MEM, is traveling to China for a project titled Assessing the effects of elevation and microsite conditions on herbivory on tree seedlings in the transitional forests of Cen Wang Lao Shan, Guangxi, South China. Wen Zhou, PhD, is traveling to Gabon for a project titled Chinese forestry investments in Gabon. *All students are candidates in listed degree programs.